Science in Our Valley Seminar: Dr. Phil Long, executive director of the Lake Chelan Research Institute, offered his presentation, “Keeping Lake Chelan Blue,” at Wenatchee Valley College. Dr. Long highlighted his extensive research on phosphorus levels in Lake Chelan and the local partners who are supporting his effort. Many thanks to the Apple STEM Network for hosting this seminar. Wenatchee Mayor Frank Kuntz, East Wenatchee City Councilmember Matthew Hepner, and Port Commissioner Donn Etherington at the Port of Chelan County’s Partners in Economic Development breakfast. Arts Commission Meeting: Arts is a key component of our K-12 education system and art provides exciting opportunities for people here in North Central Washington. As a member of the Washington Arts Commission, I participated in our recent meeting in Puyallup. The commission includes four legislative members who serve three-year terms. Apple Blossom Festival: It was an honor to participate in our 99th annual Washington State Apple Blossom Festival in the Wenatchee Valley. My family rode in both the Classy Chassis and Grand Parade this year. It is always special to see so many community members dedicate their time and resources into making the festival a success. Columbia River Treaty Presentation: The Columbia River Treaty is an international agreement between the United States and Canada, implemented in the early 1960s for the benefit of power and flood control. It is being renegotiated and modernized. The Wenatchee Valley Museum and Cultural Center hosted a speaker panel, including author Eileen Delahanty Pearkes, tribal representative John Sirois, and Chelan PUD General Manager Steve Wright. Manson Apple Blossom Parade: The community of Manson also has a long and proud history of its Apple Blossom Festival. I enjoyed participating in the parade this year with my father and two sons – three generations of Hawkins boys. I wish everyone in the Chelan and Manson area a fabulous summer, as I know many visitors are beginning to arrive for their vacations. Eight Mile Lake Public Meeting: Chelan County Emergency Management staff hosted a meeting to discuss the threat of flooding and anticipated repair work at the 90-year old Eight Mile Lake Dam in the Alpine Lakes Wilderness outside Leavenworth. The Icicle-Peshastin Irrigation District and its engineers provided information. I learned a great deal about this project and its history by attending this meeting and listening to the presentations and comments. 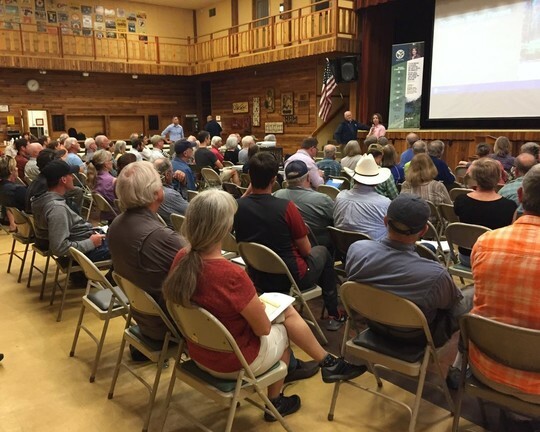 There was a great turnout in Winthrop for a forest health public meeting, hosted by Hilary Franz, Commissioner of Public Lands, and me. DNR is already hard at work this summer. Forest Health Community Meeting: Commissioner of Public Lands Hilary Franz and I hosted a public meeting in Winthrop to discuss recent legislation and the Department of Natural Resources’ 20-year Forest Health Strategic Plan. The meeting also provided an opportunity to discuss the future Virginia Ridge Forest Health Treatment near Winthrop. 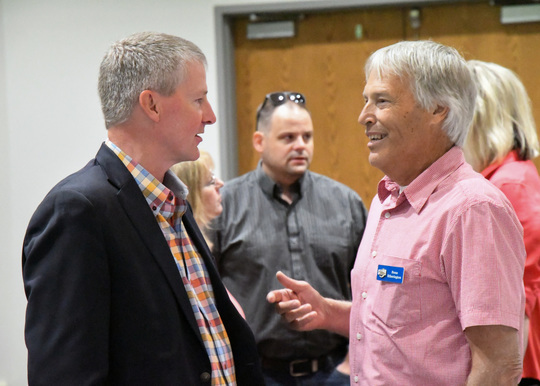 Wenatchee Learns Connect Awards: It was my honor to attend the Wenatchee School District’s Partner Appreciation Luncheon and Awards Program again this year. It is very inspiring to hear how groups and agencies within the Wenatchee Valley have come together to support career connected learning. The event was held at the beautiful Ohme Gardens. Fire Adapted Communities Conference: Governor Inslee, Representative Steele, and I participated in a roundtable discussion at the Wenatchee Convention Center where experts shared their thoughts with us about wildfire. It was very helpful information. I later provided the welcoming message to participants at Pybus Public Market. Thanks to everyone working hard during fire season to keep us safe. Partners in Economic Development Breakfast: The Port of Chelan County hosted a breakfast at the Wenatchee Convention Center to update community partners on recent activities. I am very encouraged and appreciative of the work the port has been doing. The keynote speaker was economist Mathew Gardner, who provided interesting information about our local, state, and national economy. When not in session, I sometimes can enjoy our famous outdoor recreation. 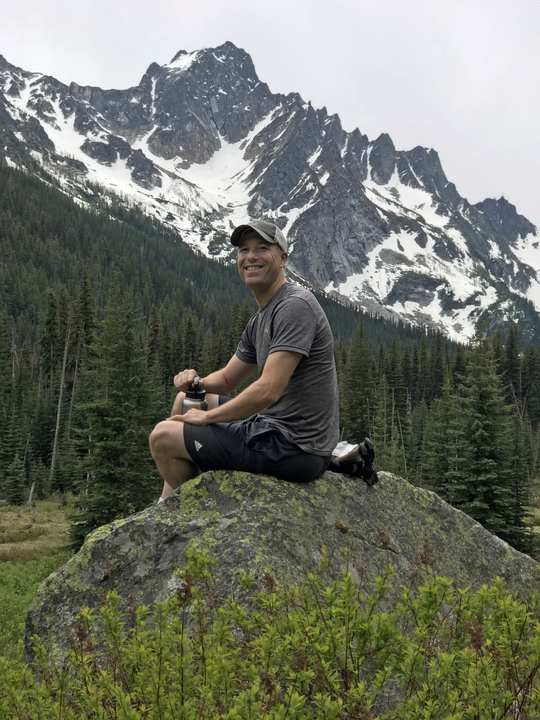 I found a great spot to rest along the Stuart Lake Trail in the Alpine Lakes Wilderness near Leavenworth. Wenatchee World Open House: I enjoyed attending an open house last evening at the Wenatchee World’s Wilfred R. Woods Production Facility. Greeting guests to help celebrate our community newspaper were new owner Francis Wick, Publisher Jeff Ackerman, Publisher emeritus Rufus Woods, and staff. The last time I saw newspaper production up close was on a Washington Elementary School field trip about 35 years ago. It was special that my son Luke, about the same age I was then, could join me yesterday. Jeff Ackerman even let him push the buttons to start the press. Hope your newspapers arrived this morning properly assembled! As you can see, there are great things happening in the 12th District. While I can’t attend all events and functions, it is always great to participate in those I can and to listen and learn from talented people in our communities. Thank you all for the opportunity to serve as our state senator.